Bad Boys for Life camera test footage has found its way online as Will Smith reveals a production start for this coming week. Filming on the highly anticipated sequel officially begins Monday, January 14th. Many were under the impression that filming had already started, but the cast and crew spent the last week in rehearsals, going as far as to watch the first two installments as a team to properly prepare for the third movie, which currently has the title Bad Boys for Life. Filming is set to take place in Atlanta and Miami. 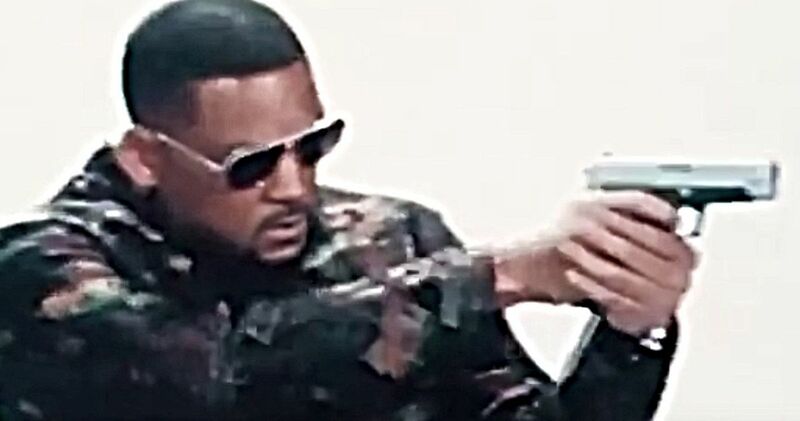 The Bad Boys 3 camera test footage features Will Smith as Detective Mike Lowrey aiming his gun at the camera, while walking towards it. There’s a few different angles, but it’s really cool to see Smith back as the character for the first time in 16 years. Earlier this week, Smith shared a picture of the scripts, which revealed the official title, and announced that day one was about to begin. There have been other images of directors Adil El Arbi and Bilall Fallah sitting with Martin Lawrence and Smith going over the script. In addition to the camera test footage, some behind-the-scenes video shows a little bit of Martin Lawrence and directors Adil El Arbi and Bilall Fallah on the set as Will Smith prepares for his camera tests. So far, it appears that the Bad Boys 3 cast and crew are already having an excellent time on the set, which bodes well for the long-awaited sequel. Smith and Lawrence have been talking about the third movie for nearly 2 decades, so it’s exciting to finally see that the project is officially moving forward. Curiously, there have not been any video or images of the rest of the Bad Boys for Life cast. Paola Nunez, Jacob Scipio, Alexander Ludwig, Vanessa Hudgens, and Charles Melton are all joining Smith and Lawrence for this outing. While they haven’t been seen yet, chances are pretty good that we’ll get our first look at the new characters this coming week as cameras officially start rolling. From the looks of things, the sequel will begin at a time when Lowrey and Burnett are no longer partners, but that obviously will not last very long. According to the Bad Boys 3 synopsis, Lowrey and Burnett are about to take on a new drug cartel in Miami and they will need the help of the AMMO crew, which includes Vanessa Hudgens, Alexander Ludwig, and Charles Melton. Specific details aren’t available at this time, but some clues should be released in the coming weeks as production continues. With that being said, it should just be exciting for fans to know that Bad Boys 3 is finally officially happening. You can check out the production start announcement below, thanks to Will Smith’s Instagram account along with the Bad Boys 3 camera tests and behind-the-scenes footage.